This badge was issued to GILLES TREMBLAY on 26 Sep 2016. 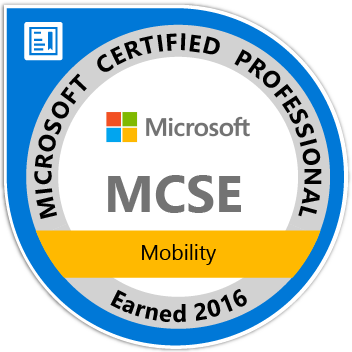 Earners of the MCSE: Mobility certification have demonstrated the skills required to manage devices in today's bring-your-own-device (BYOD) enterprise. Earning this certification qualifies an individual for a career path which can range from traditional desktop support technician to enterprise management of BYOD devices and apps.